After every race I win, I fly the American flag. People ask me all the time why I do it and what the flag means to me. And while the flag obviously has meaning for me personally, that’s not why I do it. I do it for what it means to the people who see it. The flag means a little something different to each and every person. It’s one of the few things that I think most everyone has a positive response to. Some people say it reminds them of when they served. Others say it reminds them of their parents’ service. THE AMERICAN FLAG MEANS A LOT OF DIFFERENT THINGS TO A LOT OF DIFFERENT PEOPLE AND I’M GLAD TO HONOR THEM ALL AFTER A WIN. I started doing it back in 2010. The first time was at Talladega. But when I flew it in August 2011 at Pocono Raceway, it held a lot of meaning for me. That week was an especially tough one for our military. Thirty-eight people, many of them soldiers, died when their helicopter was shot down in Afghanistan, and one of my cousins — who is also a soldier — knew a bunch of them. I wanted to pay tribute to their sacrifice. With Memorial Day approaching this weekend, I’d like to explain how I came to appreciate the service of those in our Armed Forces and why the military means so much to me. I’d also like to use this space to honor what they do. I come from a military family, though things didn’t start off that way despite our best efforts. Both my grandfathers were drafted for WWII, but they were actually sent back to their jobs because they were deemed too important to the war effort. My mom’s father was a blacksmith. My dad’s dad was a drill bit maker, and they needed someone who could drill gun barrels. Later, my uncle served in Vietnam, and I have a lot of cousins in the military on my mom’s side of the family. I PROUDLY HONOR ALL BRANCHES OF THE MILITARY. My sister, Dawn, served in the Air Force, though the story of how that happened is a funny one. She’s about 10 years older than I am, and when I was 13, I was struggling with school and considering dropping out. I felt like I actually needed more discipline than I could get in a classroom. Dawn and I had a long talk, and she asked me what I would do if I didn’t pursue racing. I told her that I might join the military. The next thing I knew, she had enlisted. But that was always my plan. If racing hadn’t worked out, I would have joined the military. Because I’d heard about it from other family members, I was fascinated with the discipline, the mental strength that it takes to be a member of the military and the code of self-sacrifice and honor that goes with it. And I was also impressed by people who were really looking to make something of their lives and took that route. It was racing, though, that really brought me into direct contact with veterans and helped me truly grasp what they do for our country. Starting in 2007, I was a part of the Navy Racing program, and I had the opportunity to go on a number of trips to naval medical hospitals. Those were eye openers. In 2008, I went to Balboa Medical Center, which is out in San Diego, and that was a time when a lot of people with injuries from the Iraq/Afghanistan conflict were being seen there. 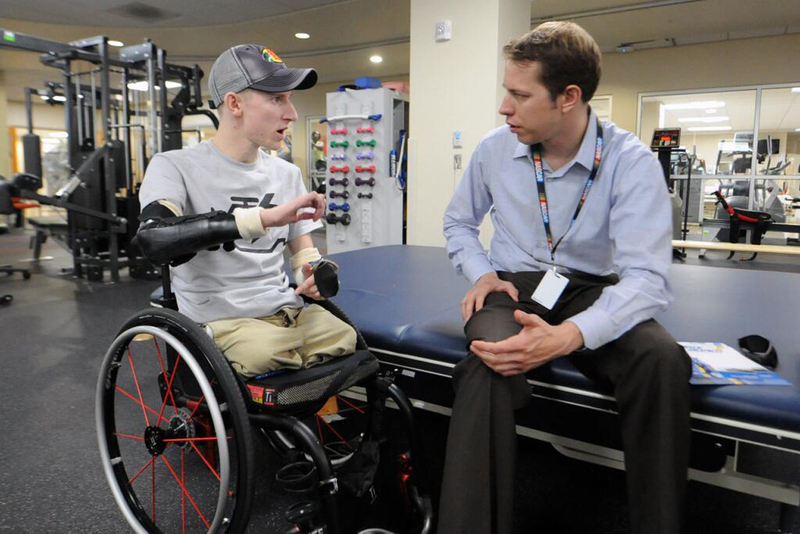 SINCE MY FIRST VISIT TO A NAVAL HOSPITAL IN 2007, I’VE GOTTEN TO MEET MANY INCREDIBLE PEOPLE WHO SERVED OUR COUNTRY. I was 24 years old and thinking that I had it tough because I was an up-and-coming race car driver. And I remember standing next to another 24-year-old, the same as me, who was a Marine or a member of the Navy, and he had no arms or legs. That was one of those moments that really sunk in. Another happened because of Lee Langley. Lee is a friend of mine and Dale Jr.’s. He did a tour in Iraq and Afghanistan and then came back and re-enlisted. The military decided they were going to redeploy him, but not until the second or third week of January of 2010. So he came back and hung out with us for a little bit over New Year’s. We kind of rekindled our friendship. Then they shipped him back over. A couple months later, the vehicle he was in ran over an IED. It exploded and killed nearly everyone. But he survived. When that happened, I lost contact with him. He wouldn’t return phone calls. He wouldn’t talk to anybody. I didn’t know what was going on with him — how could I, really. I still don’t know, but things like post traumatic stress disorder and survivor guilt come to mind. I ended up doing a hospital tour for NASCAR at Walter Reed, and sure enough, I ran into him in one of the hospital beds. He had lost part of his leg, and had a lot of facial damage. We talked. That day, I talked to a number of other soldiers, too—some of whom had suffered even more horrible injuries than Lee had. And as I got to hear some of their stories, I began to realize that the mental side of getting injured was, in many ways, even harder to deal with than the physical side. Those experiences lit a fire in me to do something for the military. MEETING AND SPEAKING WITH VETERANS LIKE BRENDAN MARROCCO HAS BEEN A LIFE-CHANGING EXPERIENCE FOR ME. I’d gone to other people’s charity events—golf events, bowling events, poker tournaments, that sort of thing. But I’m a racecar driver. I wanted to do something that felt like me. That’s how the Race 2 Recovery got started. And as we ran the Race 2 Recovery, I came in contact with veterans with unbelievable will and incredible stories. Brendan Marrocco and Taylor Morris were quadruple amputees. Cory Remsburg, who I also had the pleasure of meeting, was recently honored at the State of the Union address. The fact that these soldiers and others like them were able to survive and have such a great attitude about their lives was pretty remarkable to me. They shared an inner desire to live when others might have given up. Their ability to overcome adversity is tremendous. Their passion and mental fortitude truly inspire me. 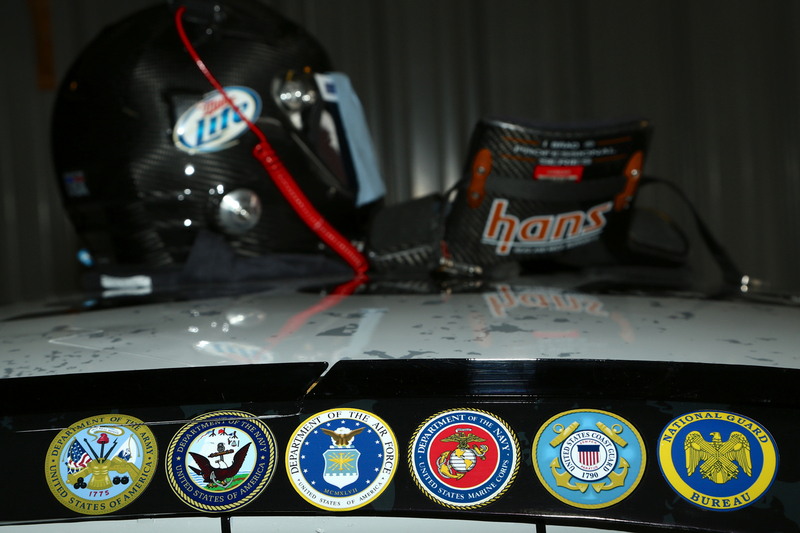 Obviously, there is no comparison to being a soldier and a race car driver. But the kind of mental strength that the best soldiers have is something I could not respect more. I’ve tried to learn from that and incorporate it into my preparation as a driver. I always think of Audie Murphy. He was 5’5”, so short that the military wouldn’t take him the first time he tried to enlist in World War II. He became the most decorated soldier of his time. 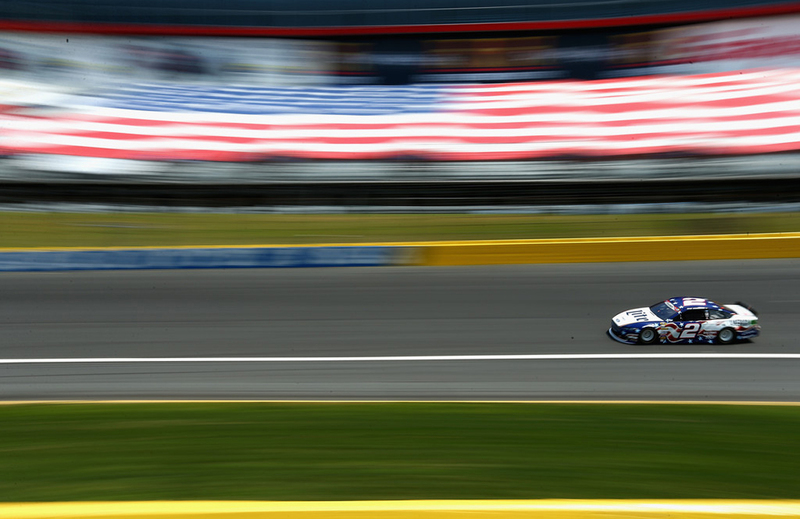 It’s no coincidence that that the biggest racing weekend of the year is on Memorial Day. NASCAR was created in 1948, three years after World War II had ended. It was created by a lot of war veterans, and a lot of the garage is populated with former military because the lifestyle is so similar. You’re kind of a gypsy in some ways. You need to have a lot of discipline and be able to follow orders, or somebody could get hurt, potentially fatally. ON THE BIGGEST RACING WEEKEND OF THE YEAR, IT’S IMPORTANT THAT WE REALIZE WHO AND WHAT WE’RE HONORING FOR MEMORIAL DAY. Because of that, there’s a real affinity between the racing community and the military world that doesn’t exist in any other sport, as far as I can tell. My guess is that there probably always will be. And if I can play some small part in perpetuating that, I would be very proud. Well young man as a veteran I will salute what you do for vets. I served and was fortunate to come out in one piece. After serving long enough to retire I have many friends that were less fortunate. I help my brother from another mother that has a service related back injury race super fours. At 52 he does not want to give up to the pain. I feel it is a bit of therapy for him. I don’t race anymore but hope to again one day. I know just the adrenalin rush of the competition is good for the spirits of us. I am sure you find many competitive vets in the sport at all levels. It is great to see what you do and I hope you can for a long time. Thank you for honoring the United States of America, our freedom, and the military veterans who have and are serving to preserve it. 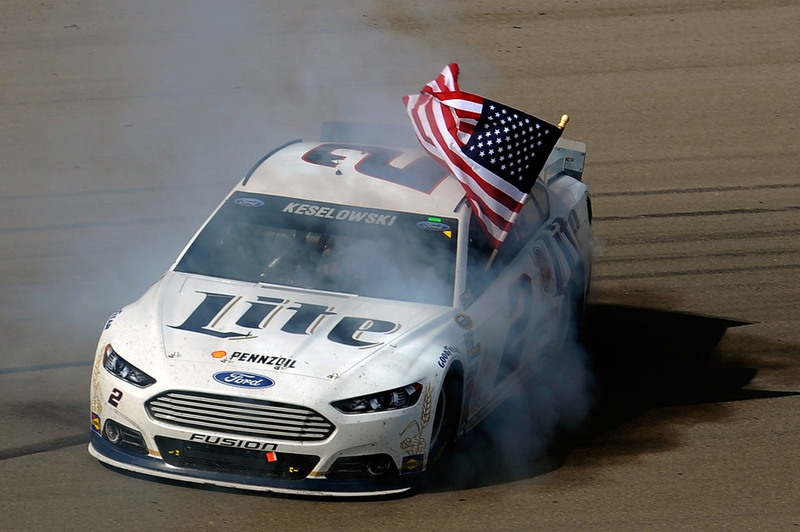 By taking “Old Glory” first on your victory laps before the checkered flag you display the importance of patriotism. As a veteran and race fan I would like to suggest that someone be designated to remove the American flag from your car before you exit and accidentally stand on it. Congratulations on your 3/24/2019 Martinsville win.